There are 897,000,000 search results on Google for Facebook advertising tips. …There’s more than enough content on this topic. However, these aren’t just your basic Facebook advertising tips that you’ll find in the majority of those articles. 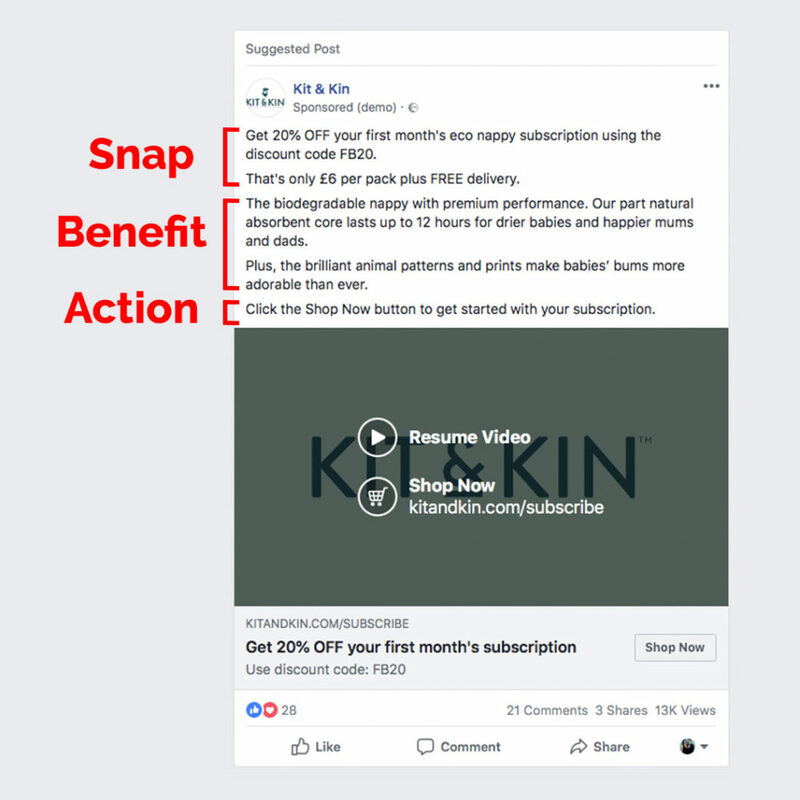 We’ve compiled 9 advanced Facebook advertising tips, ad types and tools that you can use to increase your campaign performance. These are based on the best practices that we use every day in my Facebook ad agency, Gecko Squared. 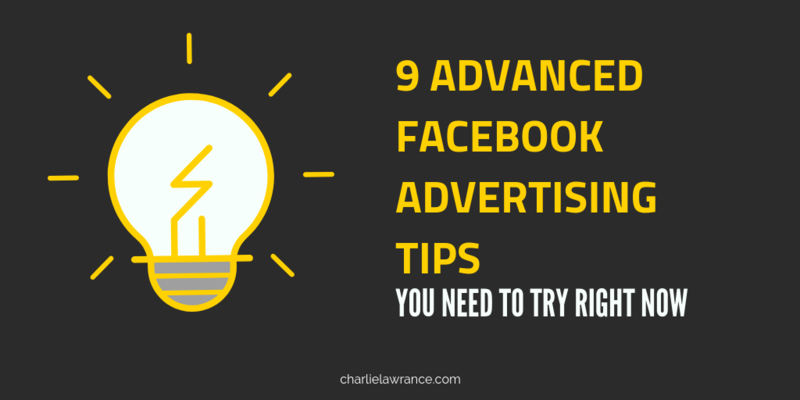 The first Facebook advertising tip is to make sure have a strategy. Don’t just position sales based ad campaigns straight to cold audiences of potential customers. They don’t know, like or trust you yet and therefore you won’t see consistent and sustainable sales or leads from your campaigns. 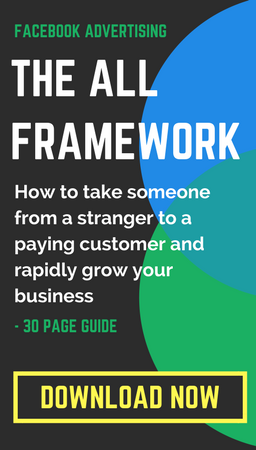 Instead, use the ALL Framework™ strategy that effectively takes someone from a stranger (cold audience) to a paying customer, by showing the right ads to the right people at the right time. The ALL Framework consists of three stages of ad campaigns. Awareness, Level 1 Remarketing and Level 2 Remarketing. At the top of the funnel is Awareness. At this stage the goal is to provide value to your target audiences through entertaining or educational video content. 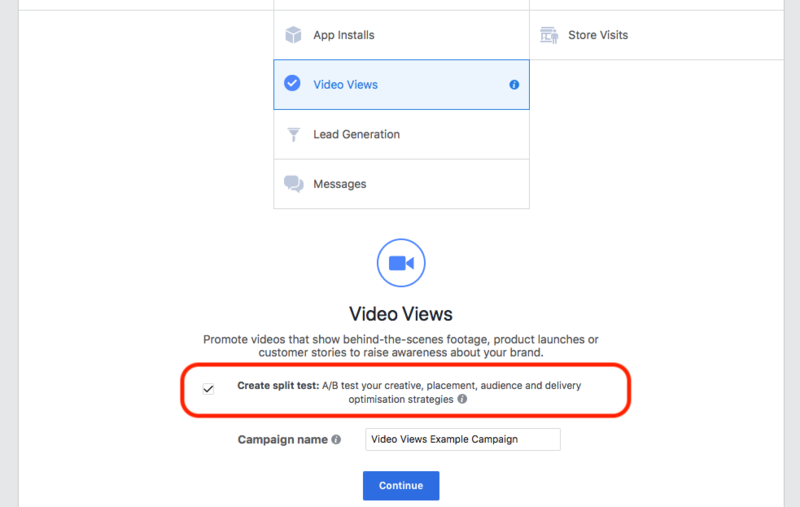 By using video ad campaigns, you can grab the attention of your target audiences in the Newsfeed and then build video custom audiences in Ads Manager to group people based on their engagement with your video content. 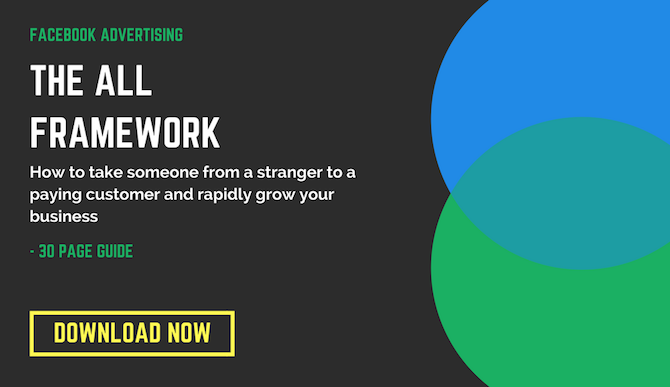 You can effectively capture the most engaged people and use them as the targeting in your Level 1 Remarketing campaigns. At Level 1, you position sales based ad campaigns that feature some type of offer, using either the Traffic or Conversion campaign objectives. Here the goal is to build consideration of your products or services by driving highly targeted website traffic, a small percentage of which will convert into new customers. At Level 2, using website custom audiences and the RTM method (more on that later) you remarket your website visitors with ads related to the pages they have viewed and actions they have taken on your website. For example, people who have viewed a specific product page, added it to cart and initiated checkout but not completed their purchase. One of the ways to create highly targeted cold audiences on Facebook is to use Lookalike audiences. There are multiple different types of Lookalikeyou can build depending on your source audience, with event based Lookalikes being one of the most effective. Using the Facebook Pixel and conversion tracking you can record the actions that matter to your business, such as purchases or leads and create website custom audiences to group these people into a new audience. You then use these event based website custom audiences as the source audience to create your new Lookalike audience. For a step-by-step walk-through on how tocreate event based website custom audiences click here. Once you’ve created your event based website custom audience, in your Audiences dashboard select Create Audience and choose Lookalike audience from the drop down list. 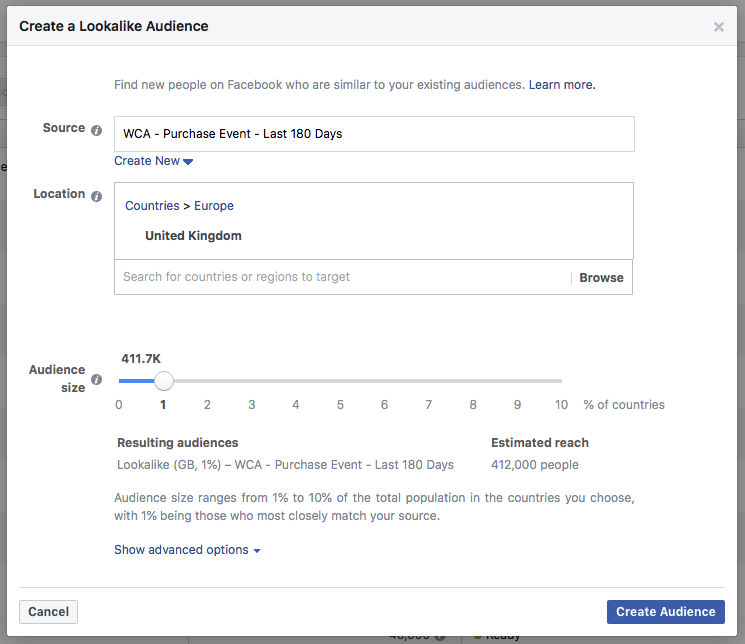 When the Lookalike audience creation window appears, in the source field, select the event based website custom audience you created and then choose your target country and audience size. Start with a 1% Lookalike audience size as this is the closest matched to your source audience and as you scale your ad spend create new ad sets to test the other sizes, 2% and so on, up to the largest audience size of 10%. Another type of Lookalike audience you can use, to find extremely relevant new target audiences, is one built from the lifetime value of your customers. A lifetime value Lookalike audience goes one step further than using your customer’s core data, such as name and email, and utilises their purchase value as well to create an even higher quality Lookalike. 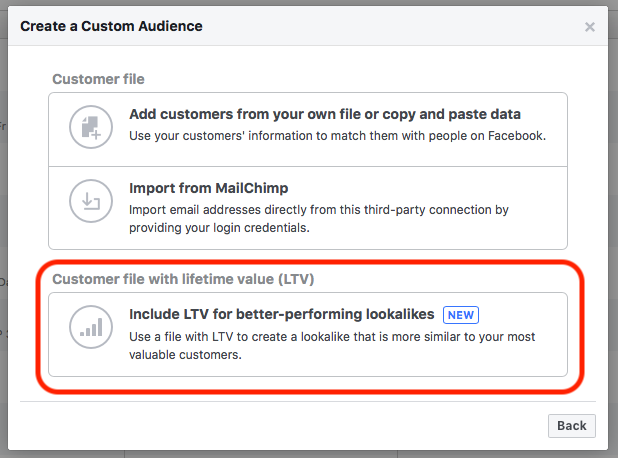 To create a Lifetime value Lookalike audience, you first need to create a Customer File Custom Audience with lifetime value. You then use this customer file custom audience as the source audience for your Lookalike. For a full step-by-step walk-through on how exactly to create Lifetime value Lookalikes, click here. One of the ways to further improve your campaign performance is to change your auction bidding from Lowest cost to Lowest cost with a cap. 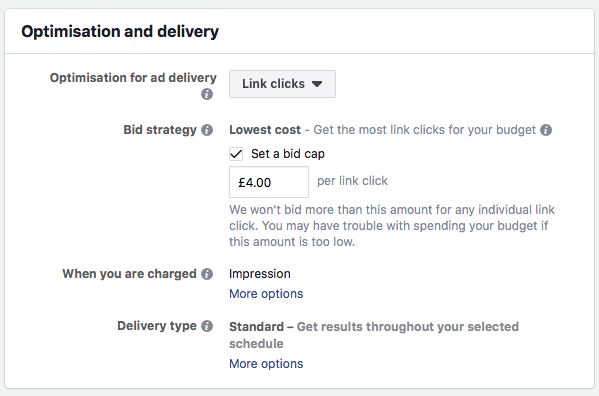 By default, Lowest cost is enabled in your Ad Sets, this is where you are telling Facebook to get the lowest cost per result possible. In order to do this they will automatically bid in the auction on your behalf for maximum efficiency. By setting a ‘bid cap’ you can do two different things depending on the cap value. The first is to set a cap to prevent costs from rising above an amount that you are comfortable with, this is especially beneficial if you know how much an instance of your optimisation event is worth to you or you know what cost per optimisation event you need to achieve to make a profit. The second way to use cap bidding is to increase the distribution of your ads within your targeting. One of the techniques to do this is called the Dominate Method. This is where you set your bid cap at three to four times the amount of your target cost per optimisation result. When you do this Facebook targets the highest quality segment of your target audience who are most likely to take the action you are optimising for and by doing this you can successfully outbid competing advertisers. For example, let’s say you’re running a Level 1 Remarketing campaign positioning a product that retails for £50 and are using the conversion objective optimising for purchases, with a target cost of acquisition of £10. Knowing the target acquisition cost,you’d set your bid cap at four times that value, which would be £40. 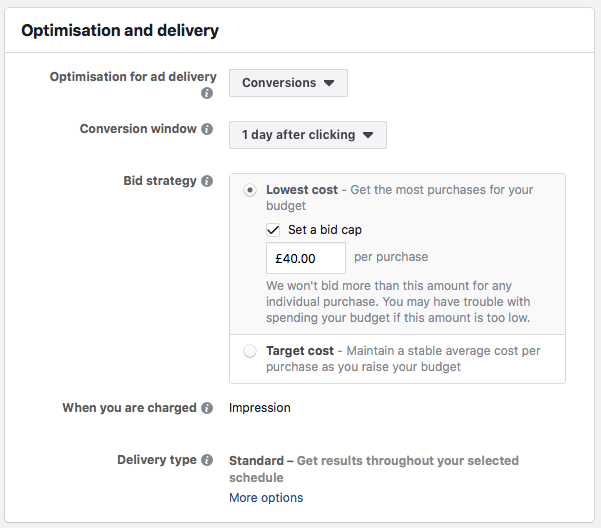 Suggested daily budget according to Facebook is five times the bid cap – £200 per day – in order to complete the learning phase with at least 50 conversion actions in the first week. #5 Position the right ads to people ready to buy using the RTM Method. The RTM method consists of three ad types: Reminders, Testimonials and Messenger that you can use, in your Level 2 Remarketing campaigns, to effectively re-engage people who have visited your website. Reminders: This type of ad is one of the most simple, yet effective. By creating ads that feature urgency in your ad copy you can encourage people to take action now. This could be simply reminding people of the offer you presented to them at Level 1 or a new limited time offer based on the product or service they’ve looked at on your website. Testimonials: These work extremelywell at the Level 2 stage as your website visitors are already in the buying decision process. By using testimonials directly in your ad copy you are creating social proof that builds the confidence and trust your target audiences need to convert into new customers. Position a single testimonial at the start of each ad followed by a reminder of the offer for your product or service that is relevant to the pages of your website they have visited. Messenger: these ads allow you to create an easy means of direct communication with your target audience. These aren’t ads with the Messenger placement but rather Traffic ads that send people straight to the Messenger destinationto start a conversation with the advertiser. Messenger ads are best used by high-end service providers where the purchase decision requires more consideration or where there are complexities that need explaining to potential customers before the purchase. This tip relates to the ad copy structure that you use in direct response ads to grab your audience’s attention in the Newsfeed and improve your ads’ CTR and drive more people to your website. Direct response campaigns position sales based ads that feature products or services and drive highly targeted traffic to your website. 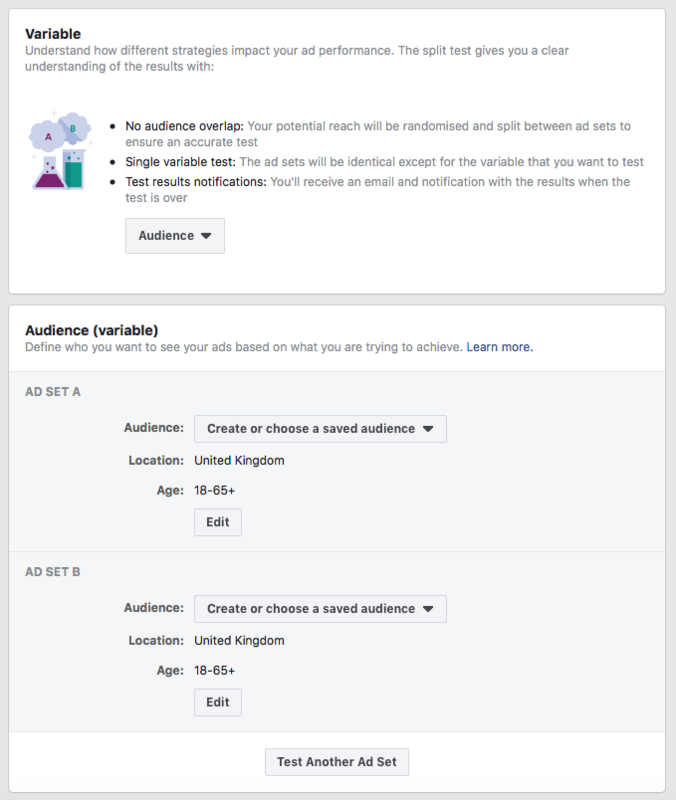 When it comes to selling on Facebook,these ads are used at Level 1, where you are targeting people who have previously engaged with your content ads. This is more effective than just positioning direct response ads to cold audiences. By showing them to people that have previously engaged with your content, predominantly videos, you’ll seebetter ad engagement rates. 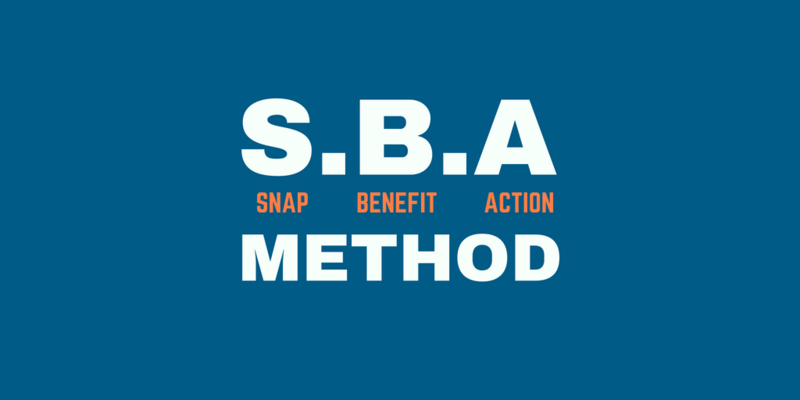 The SBA Copy Method consists of three parts, Snap, Benefit and Action. The Snap. This is the attention grabbing first line of copy. What exactly this first line of copy says will depend on what product or service offer you present in this campaign. The Snap is then followed by the Benefit. Here, you want to list core features of your product or service and the benefit of each to your target audience. When it comes to effective copy just listing features isn’t enough, people want to know how those features benefit them and their overall impact on their lives. Finally, the third part of the SBA copy method is the Action. Here you explicitly state the action your target audience needs to take in order to take advantage of the offer you’ve positioned in your ad. Keeping with the eCommerce example,the action would be a sentence at the end of your ad copy such as “Click the link below to shop now”. The Placement Asset Customisation tool (PAC) allows you to tailor your ad creative asset to each of your placements. By adjusting your ad creative to suit each individual placement,you can improve the relevancy of your ads, boosting their engagement rate and increasing their overall effectiveness. To enable this feature, at the Ad Set level of your campaigns, ensure “Edit Placements” is selected. Once you’ve chosen the relevant placements, such as Facebook Feeds and Instagram Feeds, move down to the ad level. Now at the Ad level, you have two options for how you customise your image creative. Youcan either crop a single ad image to fit the native format of each of your placements. To do this use the crop feature by clicking the crop icon in the bottom corner of your image. 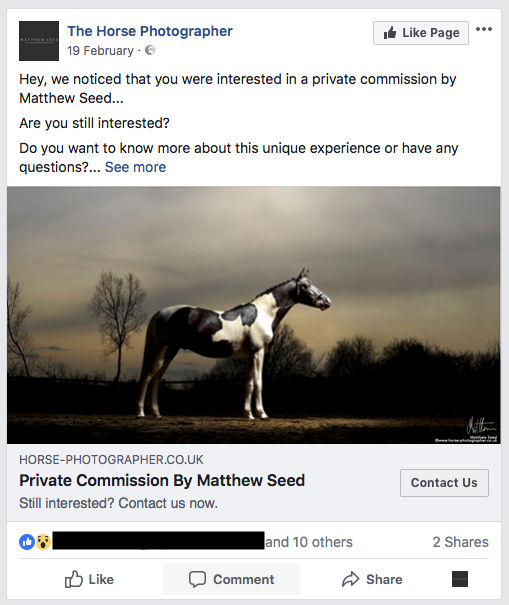 The other way to use PAC is to select a unique image that you’ve created in the native image format for each of your ad placements. To do this click the “Use a different image for certain placements” dropdown. For a full step-by-step walk-though on how to use this feature, click here. Usingthe Campaign Compare feature in the Test and Learn tool you can understand which campaign delivers themost conversions at the lowest cost to your business. 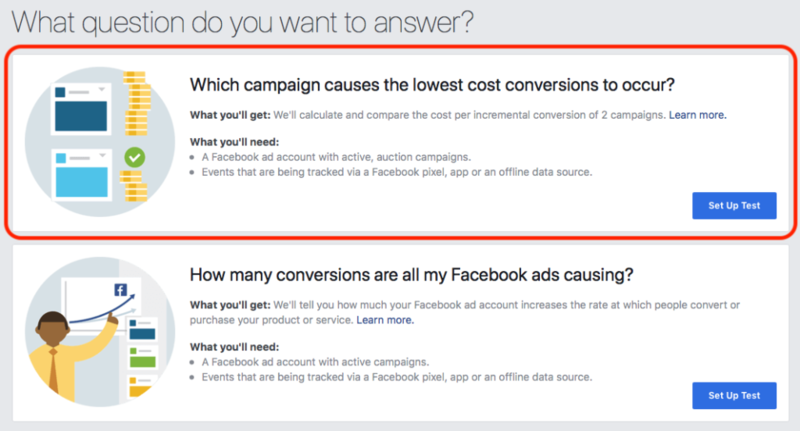 The test utilises Facebook’s conversion lift metric meaning that you aren’t bound to viewing results via attribution windows and can therefore measure the true impact of your campaigns. The first step is to select the campaign compare question in the main Test and Learn dashboard. Next, select the two campaigns you want to compare. A best practice for using this test feature is to only have a single variable change between the campaigns you are comparing. For example, you could compare the effectiveness of two campaigns driving purchases, both with the same placements and ad creative but one utilising the conversions objective and the other the traffic. 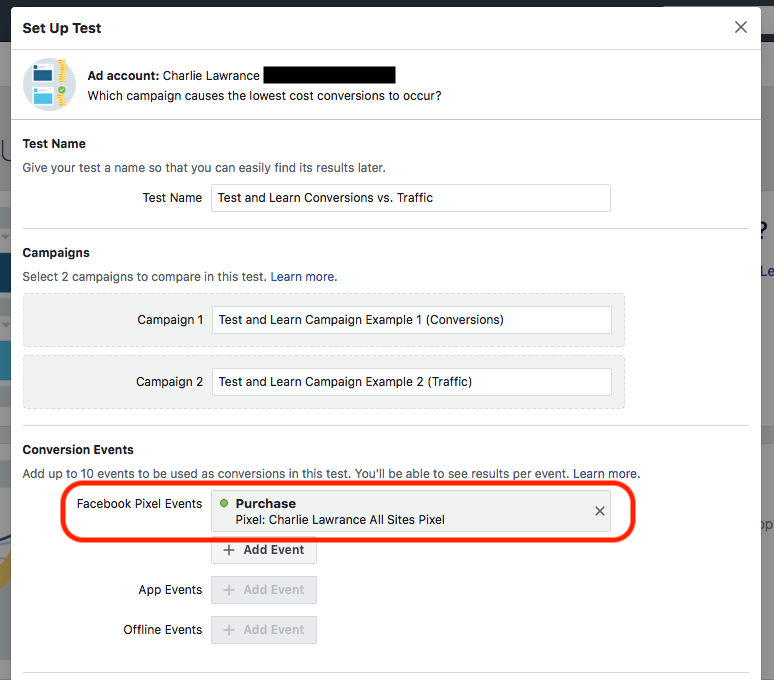 Once you’ve chosen the two similar campaigns you want to compare, you next need to select the event action that you want to track. 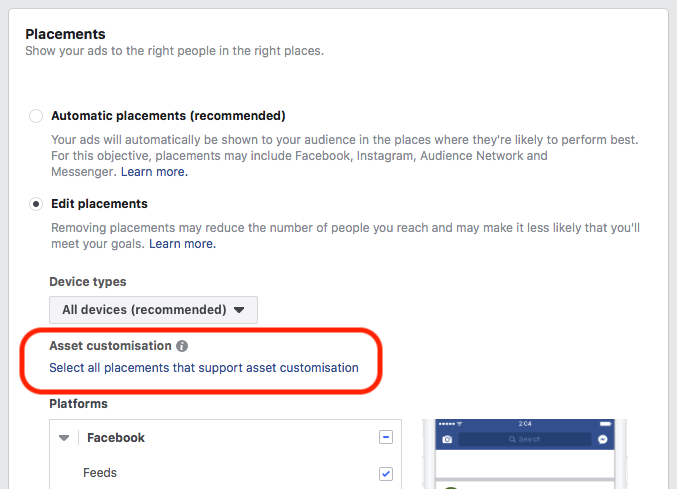 This isthe key action you want Facebook to measure as the result from the campaigns. Finally, select your test duration. To view your test results,your campaigns need to generate at least 100 conversion actions for the event that you’ve selected to track. Therefore, based on the campaigns daily budget select an appropriate time frame in which 100 conversions will be generated. For a full walk-through on how to use this feature click here for the step-by-step guide. 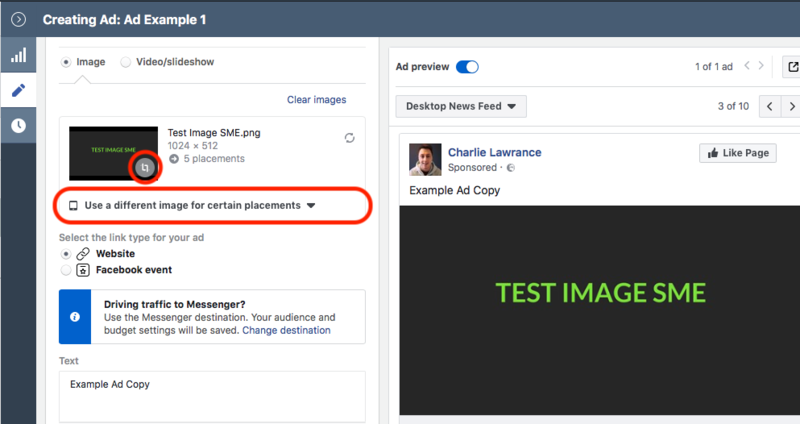 The split test tool lets you test different versions of your ads so you can see what works best to improve future campaigns. Currently, you can create a split-test comparing one of four different variables: Creative, Delivery optimisation, Audience and Placement and up to five versions foreach test. If you are using this tool for the first time, I’d recommend using the guided creation as Facebook will give you some instructions on how to create your first split-test. One way you could use this tool is to create a split-test for testing different audiences. You could test the effectiveness of Lookalikes with different source audiences for example, such as one built from purchases and another built from Add to Cart actions. To create an audience split test, click Create in your Ads Manager dashboard. Then choose your objective and ensure the split test box is selected. In this example, we want to compare the effectiveness of two different audiences at the Awareness stage,so we are warming up cold audiences with video content and therefore want to use the Video Views Objective. Once you’ve selected your objective it’ll take you to the Ad Set Level. Here select the Audience variable from the Variables section. You’ll then see two audience sections, one for Ad Set A and one for Ad Set B. You can either create a new audience directly or select a Saved audience. Once you’ve chosen the two audiences that you want to test, complete the rest of your ad set such as your placements, delivery optimisation, budget and test duration. 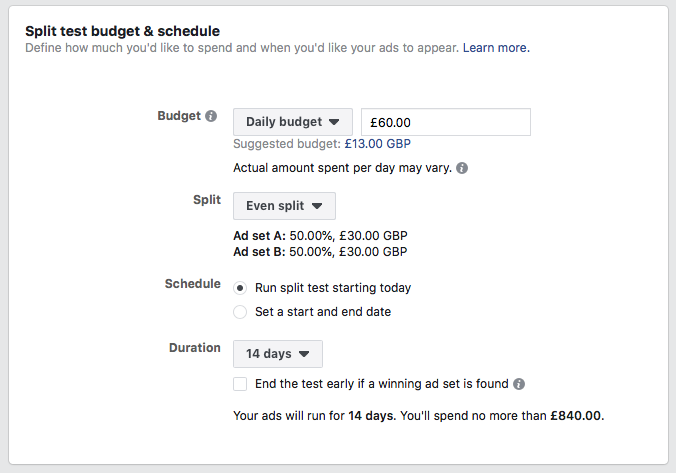 Start with an even budget split between the two ad sets and then select your test duration, which can be between 3 and 14 days. Finally, at the ad level create or select an existing post. 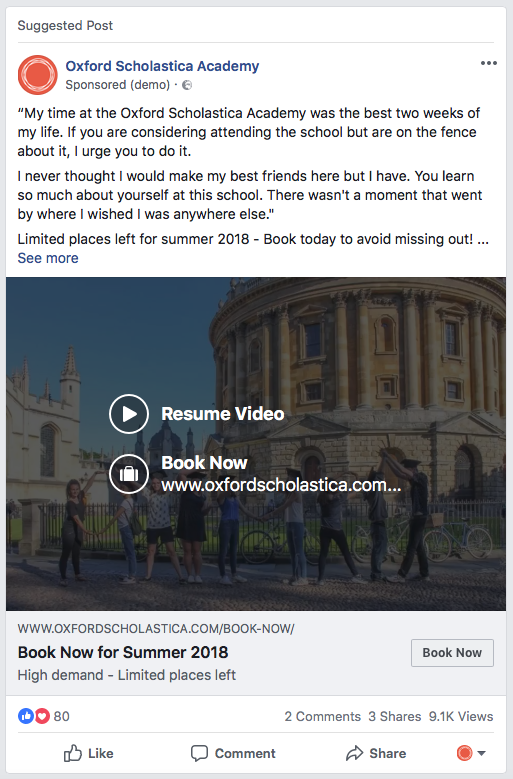 If you already have an ad that has worked well in previous campaigns you can click on Use Existing post and enter the Post ID to maintain the social engagement and total video views. If not, go ahead and create new ad using the ad creation panel. In this case as we’ve chosen the video views objective, we’d upload the video we want to use and create a headline and description in the text section. 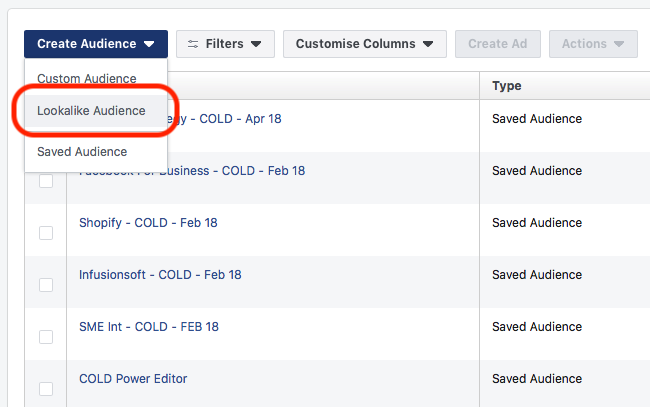 There you have it, multiple Facebook advertising tips, ad types and tools that you can use to improve your campaign performance. Ultimately, successful Facebook advertising starts with the correct strategy and positioning and then on a tactical level the latest tools and proven ad types will further increase your campaign effectiveness. What do you think? Do you regularly use some of these tactics with your Facebook campaigns?